lan Shepard was the brashest, cockiest, and most flamboyant of America’s original Mercury Seven, but he was also regarded as the best. Intense, colorful, and dramatic—the man who hit a golf ball on the moon—he was among the most private of America’s public figures and, until his death in 1998, he guarded the story of his life zealously. 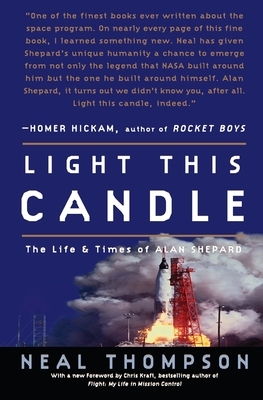 Light This Candle, based on Neal Thompson’s exclusive access to private papers and interviews with Shepard’s family and closest friends—including John Glenn, Wally Schirra, and Gordon Cooper—offers a riveting, action-packed account of Shepard’s life. Among the first men to fly off aircraft carriers, he was one of the most fearless test pilots. He endured long separations from his devoted wife and three daughters to fly dangerous missions, working his way up the ranks despite clashes with authority over his brazen flying maneuvers and penchant for risky pranks. Hugely competitive, he beat out John Glenn for the first Mercury spaceflight and then overcame a rare illness to return to space again on Apollo 14. He took every challenge head-on and seemed to win every time. Long overdue, Light This Candle is a candid and inspiring account of a bold American life. Neal Thompson is a veteran journalist who has worked for the Baltimore Sun, Philadelphia Inquirer, and St. Petersburg Times. He has also written for numerous national magazines, including Outside, Men’s Health, Backpacker, and the Washington Post Magazine. Thompson lives with his wife and their two sons in Asheville, North Carolina, where he teaches at the University of North Carolina and is writing a book about moonshine, NASCAR, and the South. Visit his website at www.nealthompson.com.